Battle Prism is a 5-dimensional multiplayer battle game. Each color (Red, Green, and Blue) is its own spacial dimension. Players can switch colors at-will but can only interact with tiles and other players that are the same color as that player. Battle Prism began as a 2014 Global Game Jam Entry called Prism Break. We had a lot of fun with this idea and are continuing work on the game. Check back here for updates on our progress! Speaking of progress… here's an album of progress. One-color-switching game mechanic has been implemented. Instead of being able to switch freely to either of the other colors, the color you can switch to is determined by the color you're standing in front of. For example, if the player is blue and is standing in front of a red tile,he can switch to green. 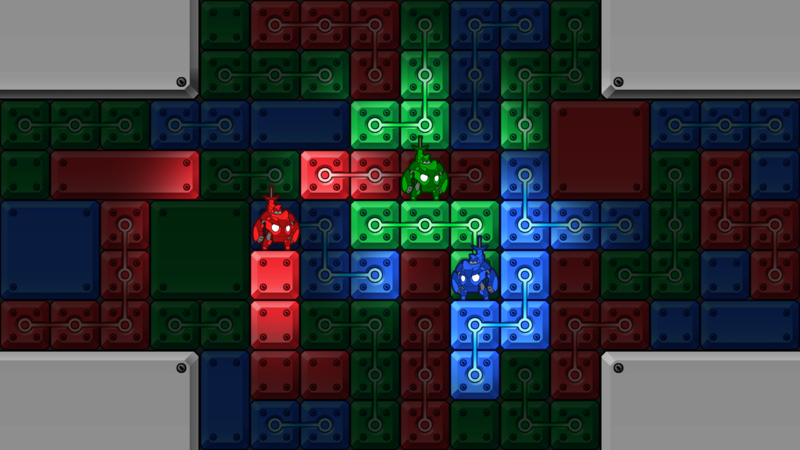 If the player is blue and is standing in front of a green tile, he can switch to red. This prevents players from being stuck inside of a platform when they switch colors. It also adds a little more strategy to navigating the map and attacking. Testing the new lighting system. This makes it much more obvious which tiles are in the foreground and which are in the background.